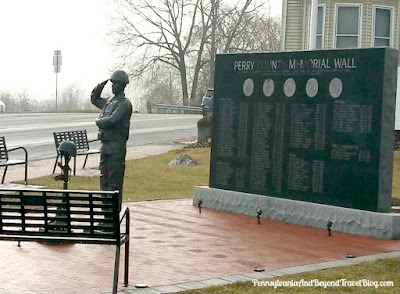 The Perry County Memorial Wall is located along routes 11/15 in Marysville, Pennsylvania. If you're unfamiliar with the area, you'll find it located right across the street from Blue Mountain Outfitters and can clearly been seen as you drive along the heavily traveled routes 11/15. 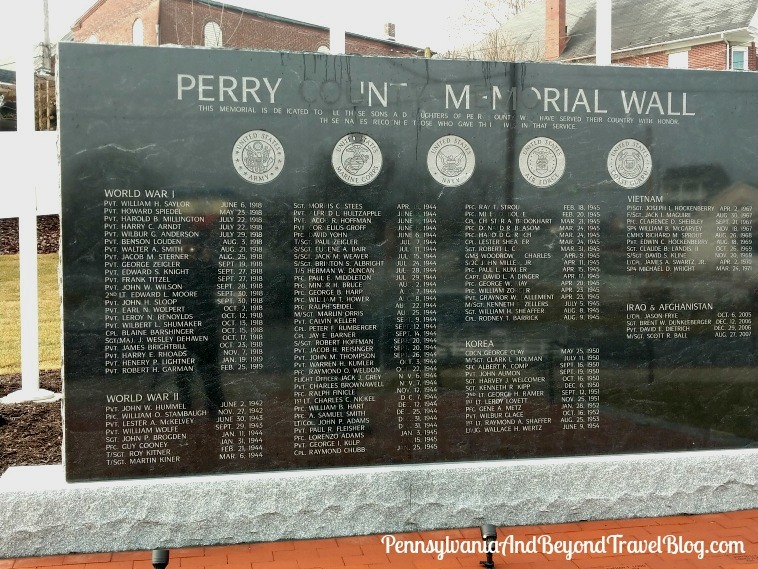 This beautiful war memorial wall honors fallen heroes from Perry County starting with World War I through current times. It's a great way to remind all of us that freedom isn't free and it comes with a heavy price. These men and women sacrificed their lives for our country. What a great way to honor them and their families. 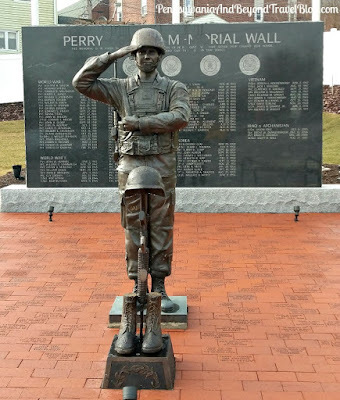 When visiting you'll find free off-street parking nearby and you can walk the Memorial Wall. Its open to the public 24 hours a day, 365 days a year. 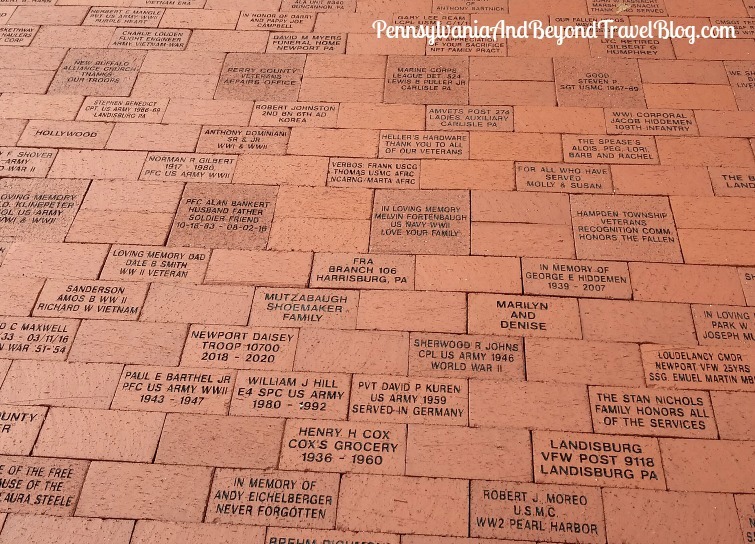 You'll notice that it covers all branches of service and covers World War I, World War II, the Korean War, Vietnam, Afghanistan and Iraq Wars. 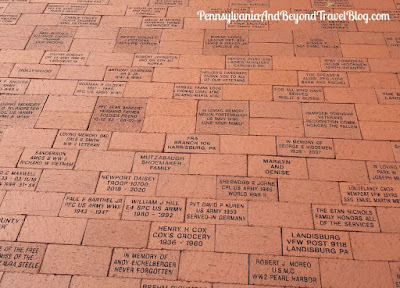 It lists the soldier's rank, name and date of their passing. 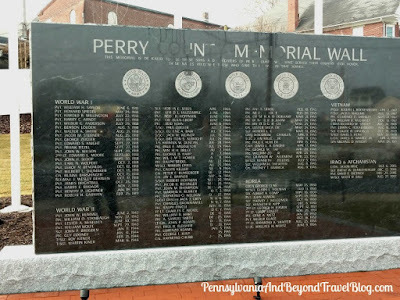 This is to remember all of those Perry County soldiers that were KIA (killed in action). There is a beautiful bronze monument (statue) in front of the Memorial Wall of a soldier giving his fallen comrade his final salute. I really recommend that you stand in front of the monument to get the full effect and meaning of this beautiful site. The first time that I visited...it brought tears to my eyes. You can learn more about the Perry County Memorial Wall and the women behind creating it and how it all got started by visiting their website online or by connecting with them on Facebook. They're currently accepting donations and you can check out their buy-a-brick and buy-a-paver donation programs. Note: You can double-click on each image to have it open up in a new browsing window and in an enlarged size. We're a mobile reader-friendly website. Thank you!